the Climate Data Initiative, aimed at helping organizations and communities use public data to better understand and prepare for the effects of climate change. Up until now, it’s been difficult for the public to locate detailed, timely data relevant to climate-related risks such as extreme weather events. To help address this challenge, Google is donating cloud computing storage and access to other tools to support institutions that are driving climate change resilience. First, we’re providing 50 million hours of high-performance computing on the Google Earth Engine geospatial analysis platform. Earth Engine brings together the world’s satellite imagery with tools to help detect changes and map trends on the Earth’s surface. Earth Engine has already been applied to unlock valuable information from the 40+ year treasure trove of Landsat satellite data (USGS/NASA), including an interactive timelapse of the planet from 1984-2012, the first high-resolution global maps of deforestation, and a near real-time deforestation alert system that allows anyone interested in forest monitoring to take part. We hope that with this new donation, researchers will focus on applying Earth Engine to address climate-related risks such as managing agricultural water supplies and modeling the impacts of sea-level rise and storm surge. We’re also partnering with leading researchers, allowing them to scale their work with Earth Engine and quickly move from the laboratory into people’s hands. Together with academic partners in the western U.S., we’ll produce the first high-resolution, near real-time drought monitoring and mapping products for the entire continental United States—and make them freely available to the public. 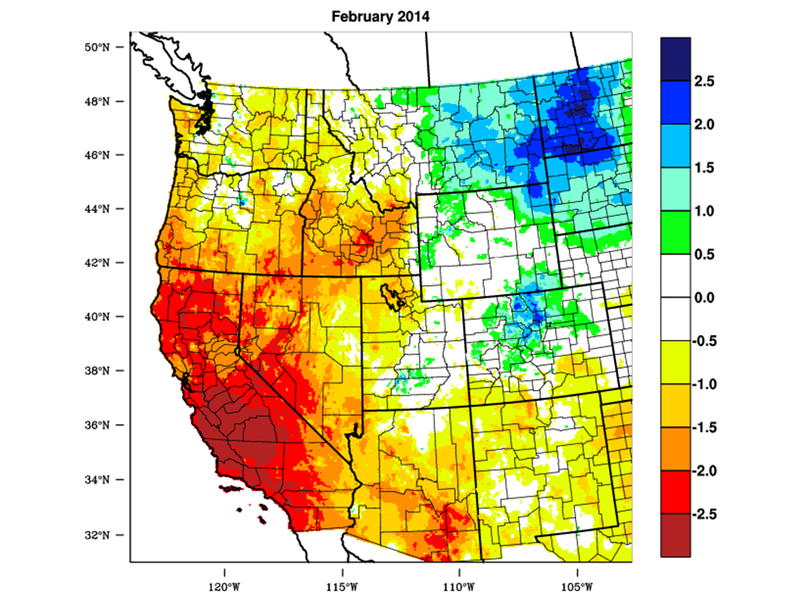 Traditional static graphic showing record-breaking drought in California in Feb 2014. Red = Dry; Blue = Wet. Source: the Desert Research Institute, University of Idaho and University of Nebraska-Lincoln. Finally, we’re donating one petabyte (one billion megabytes) of cloud storage to house satellite observations, digital elevation data, and climate/weather model datasets. We encourage the global community to work with us on this project by contributing and curating data, and developing public-benefit applications. We’re already collaborating with researchers at NASA Jet Propulsion Laboratory, University of Bristol U.K. and the government of Australia. 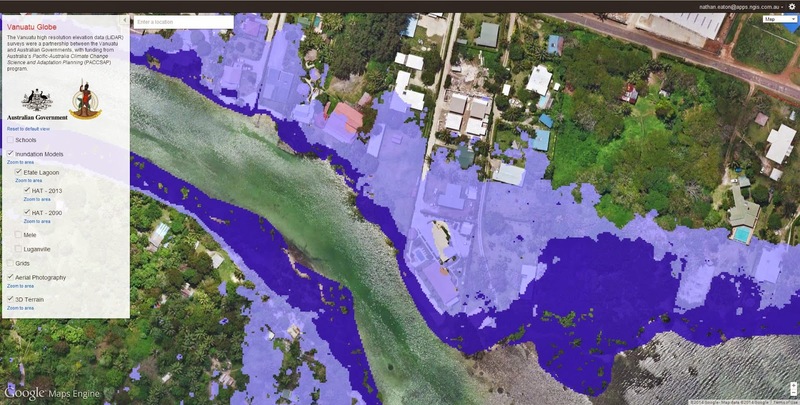 See how Google Maps Engine was used to highlight the vulnerabilities associated with rising sea levels, storm surges, and coastal inundations in the Republic of Vanuatu. The darker blue shows present-day inundation of the Efate lagoon during a high astronomical tide, and the lighter blue shows predicted inundation in 2090 due to sea level rise. Source: Australian Government and the Cooperative Research Centre for Spatial Information. To find out more, visit the Earth Engine website, view a sample map on the Google Maps Gallery, follow us on Google+ and Twitter, and tune in to White House live stream today at 5:15pm EDT. Today the White House announced the Climate Data Initiative, aimed at helping organizations and communities use public data to better understand and prepare for the effects of climate change. Up until now, it’s been difficult for the public to locate detailed, timely data relevant to climate-related risks such as extreme weather events. To help address this challenge, Google is donating cloud computing storage and access to other tools to support institutions that are driving climate change resilience.